In a major revelation, Gujarat’s rate of growth for the financial year 2012-13 was not only below the national average, but less than all major Indian states which have cared to make public gross state domestic product (GSDP) figures for that year. 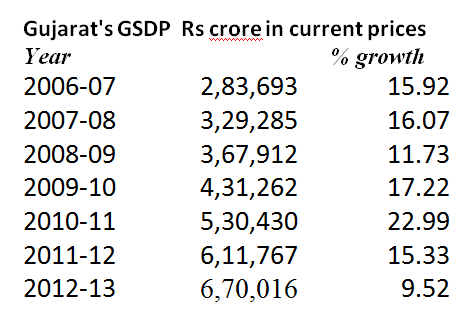 Latest GSDP figures, revealed by Gujarat’s finance minister Nitin Patel while presenting the interim budget for 2014-15, suggest that the state’s growth rate at current prices (i.e. without deducting inflation) in 2012-13 was just 9.52 per cent (rising from Rs 6,11,767 crore in 2011-12 to Rs 6,70,016 crore in 2012-13). This is against the national average (at current prices) of 13.26 per cent. 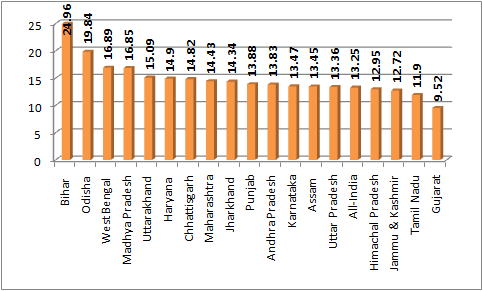 More important, no major Indian state experienced such low growth rate. Planning Commission figures show, Andhra Pradesh’s rate of growth was 13.83 per cent, Assam’s 13.45 per cent, Bihar’s 24.96 per cent, Chhattisgarh’s 14.82 per cent, Haryana’s 14.90 per cent, Himachal Pradesh’s 12.95 per cent, Jammu & Kashmir’s 12.72 per cent, Jharkhand’s 14.34 per cent, Karnataka’s 13.47 per cent, Madhya Pradesh’s 16.85 per cent, Maharashtra’s 14.43 per cent, Odisha’s 19.84 per cent, Punjab’s 13.88 per cent, Tamil Nadu’s 11.90 per cent, Uttar Pradesh’s 13.36 per cent, Uttarakhand’s 15.06 per cent, and West Bengal’s 16.89 per cent. While the Planning Commission has not yet made public GSDP figures for three states – Rajasthan, Kerala and Gujarat -- Gujarat’s GSDP figures were revealed by the state finance minister while presenting the budget on February 21, 2014 in a very strange way to suggest great strides made by Gujarat. He said, “The GSDP (at current prices), which was Rs 1,11,139 crore in the year 2000-01, has increased to Rs 6,70,016 crore in the financial year 2012-13.” For obvious reasons, the finance minister did not care to make a comparison with 2011-12 figures, which have been in public domain. Gujarat’s 9.52 per cent rate of growth figure has come to light a year after a top Gujarat government budget document, “Statements Under the Gujarat State Fiscal Responsibilities Act, 2005”, had predicted a rate of growth (at current prices) of 13.98 per cent for financial year 2012-13. According to the document, which was released in February 2013, the GSDP in 2012-13 was to be Rs 6,97,298 crore as against Rs 6,11,767 crore in the previous year, 2011-12, suggesting a 13.98 per cent rate of growth. Constant price muddle: 3% rate of growth? Meanwhile, economists and financial experts wonder as to why is the Gujarat government shy of revealing GSDP figures for 2012-13 at constant prices (by deducting the rate of inflation, and which would suggest the real growth rate). The figures have still not been handed over the Planning Commission. Constant price GSDP figures are Rs 367,540 crore for 2010-11, which rose to Rs 3,98,884 in Rs 2011-12, a rise of 8.53 per cent. If these experts are to be believed, 8.53 per cent rate of growth was achieved when the GSDP at current prices rose by 15.33 per cent. “While the Gujarat government has still not revealed its deflator rate to deduct inflation for 2012-13, a current price rate of growth of 9.52 per cent should mean, the state economy at constant prices grew by less than three per cent”, an expert said, making a wild guess.